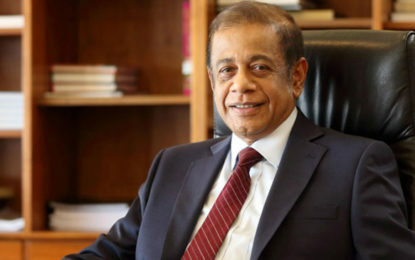 (FASTNEWS|COLOMBO) – Ambassador of Afghanistan for Sri Lanka, M. Ashraf Haidari on Wednesday (5) paid a courtesy call on the Commander of the Army, Lieutenant General Mahesh Senanayake at the Army Headquarters in Colombo upon his recent assumption of Office in Sri Lanka. 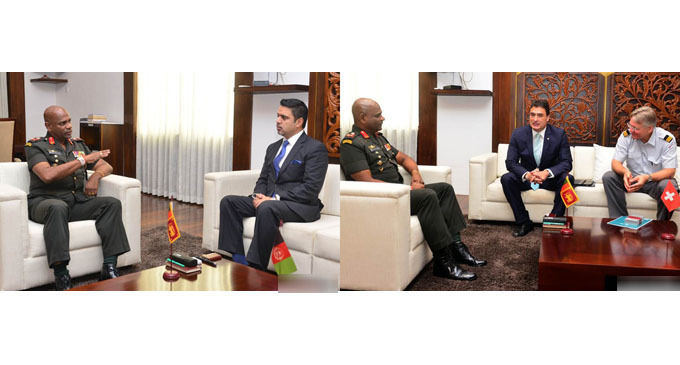 During the meeting, Lieutenant General Senanayake, and the visiting Afghan Ambassador exchanged views on bilateral matters of mutual interest with focus on on-going Army-involved development roles. Meanwhile, the Ambassador Extraordinary and Plenipotentiary of Switzerland for Sri Lanka and the Maldives, Hanspeter Mock also paid a courtesy call on the Lieutenant General Senanayake yesterday at the Army Headquarters. The meeting focused on matters of mutual interest as it was Swiss Ambassador’s first visit to the Army Headquarters upon his assumption of Office in Sri Lanka. Defence Attaché in the Swiss Embassy Colonel Christof Gertsch was also present during the courtesy visit.